Finally got a NEW VOTE INCENTIVE! It's a WIP of my contribution to SpiderForest's Charity Zine, featuring an adorable little Yasha and her doggo. That is indeed the same little ray of sunshine!!! Yasha is 15 in the flashback. Look at her!! Is that a smile i see?? Whaaaat!? Although I must say, this is probably not the best time to be having a flashback seeing as the guy she just hit in the face seems to be back on his feet?? Also low key Yasha’s dad (yep, that’s her dad) has the exact same face and hair color as that village elder from page 13 lol, but they are different characters… i swear.. didn’t notice the similarity till after the page was finished. But they are both pretty minor so I am gonna give myself a pass on this one . RE: shoulder issues. I do appreciate the concerns. I too, do not want to become crippled from making comics. I’ll be posting once per week. I’ll continue working at a pace that feels right , and who knows? Maybe I’ll even build up a buffer?? I’ve got a tiny 1 page buffer right now and am waaay too proud of myself. So. I will see you on Tuesday! On time! 12 am Tuesday CST. be here. 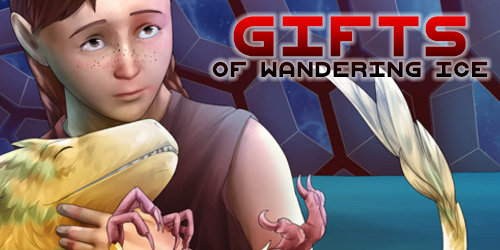 Lastly, this is the final week of the SpiderForest comic of the week exchange! I already posted about this one, but in case you missed it... It’s a good comic with a large archive about a world that is also facing some geological shenanigans. Please check it out!